­­­­­­­Getting ahead in the Gig economy is not an easy task. Following certain steps can help you be well on your way to becoming a top tier freelancer. 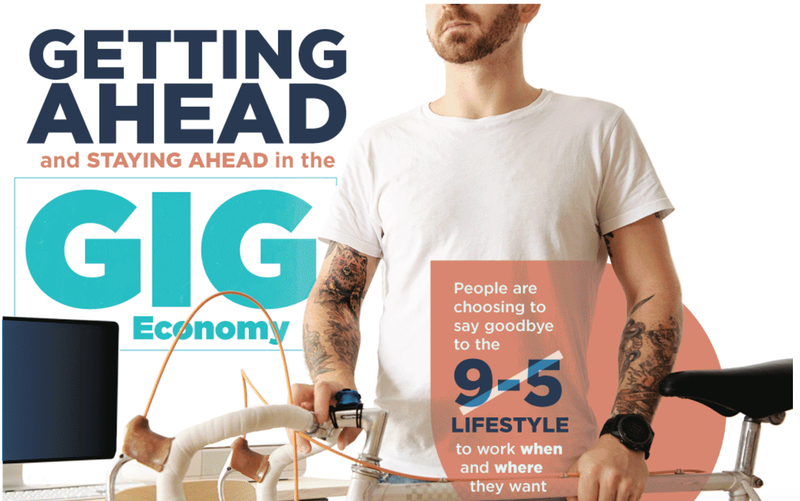 Many Americans are saying goodbye to the traditional 9-5 lifestyle in favor of a much more flexible schedule that works around what they need. In 2016, nearly 53 million Americans were freelancers, that’s 34% of the workforce! Projections show that by 2020 43% of the U.S. workforce will be freelancers. The work of the freelancer is independently contracted and can cover relations with multiple clients. Multiple clients are easier to please than your traditional setting where the only client is your boss. Freelancing has great advantages that make it possible for you to be your most productive while still working the equivalent of a forty-hour week. The freedom of freelancing gives you the ability to work with fewer distractions throughout the day or night. Some studies have shown that times as early as 4 AM may be when you’re at your most productive. If setting your own schedule isn’t attractive enough you can also work from wherever you want. Whether it’s a coffee shop, the beach, or your own home — comfort is key. Freelancing gives you every opportunity to have the greatest comfort while working on your latest project. Stanford University has even gone so far as to say that remote employees are 13% more efficient than employees in an office. If that’s true of remote workers, think of all the benefits this carries for freelancers. As a freelancers you’re working in a field you’re passionate about. You’re setting your own schedule to fit when you’re most productive, and you’re working with fewer distractions. Freelancing means that time management is key. Your schedule revolves around you, so if you’d rather work after the kids are in bed you can do that. You are your own boss! You also have freedom to turn down projects you don’t want to work on. The typical employee can’t say no to the boss, but a freelancer is able to work on what draws their interest most. Getting sick on is less common for the savvy freelancer. Offices with more than six people often take 62% more sick leave. Freelancers who have the freedom to work remotely or in a private office are healthier. Less sick leave means more opportunity to work without fear of the next office wide stomach bug. A study from 2014 found that the average worker spends nine days a year commuting to work. Freelancing can cut commuting times to zero and help you reclaim that lost time. It’s not just the time wasted on commutes that can a be a problem, but the fact that longer commutes can harm your health. Commuting has been associated with higher blood sugar, decreased life satisfaction, and greater anxiety. With all the time you save freelancing you can grow your brand and strive to live a healthier lifestyle. Freelancing is not without challenges. There are plenty of ways to strive for success in the gig economy as a freelancer. Being your own boss means you have only yourself to rely on so you have to advocate for yourself. The best and brightest freelancers always keep a few business cards handy just in case they run into a potential client. Consider your brand. You should treat yourself like a company. Successful companies have to be marketed, not just through advertising, but through good work and consistently met deadlines as well. Think of your online presence. Make sure to create a website with a portfolio of your work. Keep it up to date with your most recent projects. Showcase your services and display the work you’re proud of. Keep it handy to share with potential clients whenever they ask. Nothing says you are not professional like an out of date portfolio. Networking can be just as important as marketing. The people you’ve worked for before are valuable. Maintain those relationships and relationships with other freelancers to keep up a steady flow of work. Maintaining positive relationships with past clients will likely yield more work. Most clients would rather work with a talent they know. They will also be more likely to recommend you to other potential clients. If you maintained that good relationship and do good work, they will be there for you. Repeat business and recommendations can be a significant portion of your income. You’re not just your own boss, you’re your own PR department. You’ve got to manage and update your site, order your own business cards, and do good work to build a professional reputation. Professional is as professional does. Draw up contracts with clearly outlined costs, deadlines, and terms. Complete work on time as agreed, because your reputation is essential to maintaining your freelance business. Craft your schedule to ensure that all the work you’ve contracted to do is finished on time. To keep clients coming back you need to complete your contract on time. A project that is completed on time and done well will undoubtedly lead to a growth in reputation and potential new contracts through word of mouth recommendations. As a freelancer you don’t receive a simple W-2 from each client, but separate 1099-Misc for each client. Self-employed individuals are also required to pay a 15.3% tax. This covers Medicare and Social Security alongside regular income taxes. Freelancers are entitled to make plenty of deductions, including business related food expenses, lodging, office expenses, and necessary equipment. You can deduct these expenses from your taxes. Do remember that at the end of the day you have to report all your deductions to the IRS. Having an item regardless of whether you were running your freelance business or not would not qualify for a deduction. This means that your new iMac may not qualify for a deduction — if you would buy it anyway. Being a freelancer also means you don’t have health insurance through an employer either. In 2016 the penalty for not having health insurance was 2.5% of an individual’s income or $695. Whichever was higher. A freelancer should definitely consider using Healthcare.gov to find a provider that can best fit their needs. If your spouse has insurance through their employer add yourself to their plan if possible. Considering retirement as a freelancer, young or old. Retirement may seem like a remote possibility. Investigate what works best for you when planning for your future. You can open up an individual retirement account (IRA). An IRA can take one of two forms. With the traditional option all contributions are tax deductible, but withdrawals are taxed. A Roth IRA option would means that all contributions are taxed, but withdrawals are tax free. A freelancer can also open an simplified employee pension (SEP) through a broker and invest however they want. Through a SEP freelancers can contribute over $5,500 a year, and those contributions are all tax-deductible. A Solo 401k can be opened through brokers or a mutual fund company. The Solo 401k allows $18,000 in annual contributions plus 25% of net earnings. This means it comes from self-employment or up to $53,000 annually. So, now that you’re armed with all this knowledge are you ready to be your own boss? It’s not the easiest route, but it can be extremely rewarding. Are you prepared to follow the freelance dream or do you prefer the 9-5 routine? Jacob Adams is a writer and promotions intern for NowSourcing.com based in Louisville, Kentucky. When he's not writing articles Jacob likes to enjoy coffee from local roasters in Louisville and spending time with friends. Previous PostWhat Is the Payment Facilitator (PayFac) Model?